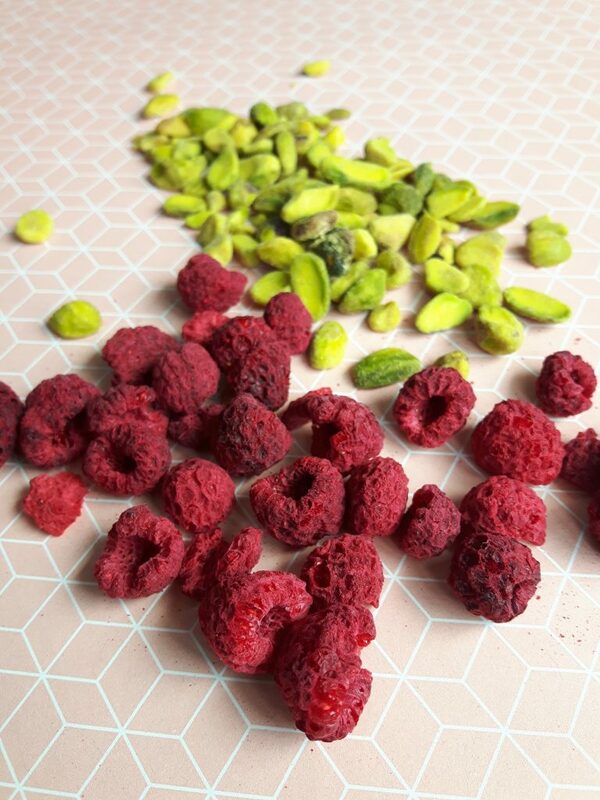 Pistachios and raspberries are a nice fit. This past summer in Poland I remember having a chocolate or perhaps it was an ice cream with such a combination and it was magical, not so much to make me remember what it was on, but the combination of the two stuck. 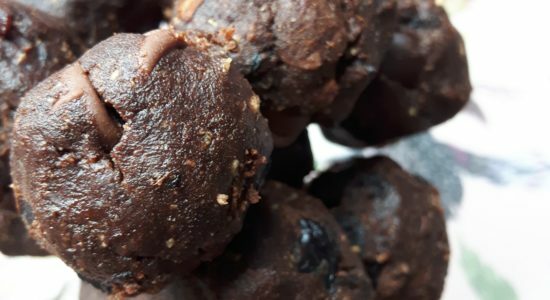 I had been meaning to make some energy balls, as the ones with Spirulina I was testing out where a little heavy in Spirulina’s ocean-y taste. These ones, on the other hand, are just right. They have a maca and cordyceps kick to them, so they help you adapt to stress, fatigue and boost your energy as well as simultaneously aiding in balancing your hormone levels and issues. If you are new to maca or do not supplement regularly you should start off with 1 tbsp. 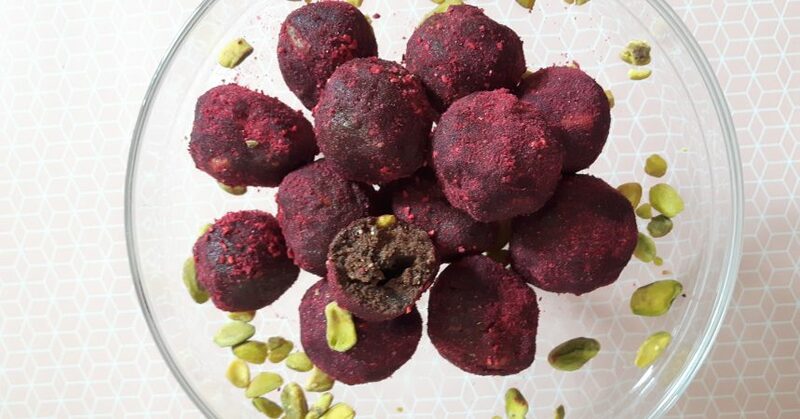 Maca is a whole food and does not have any toxicity limit, however as it is an adaptogen and has a powerful influence on hormones and energy balance when taken at a high dose too quickly it can cause, in some individuals, increased heart rate and nervous energy or jitters. 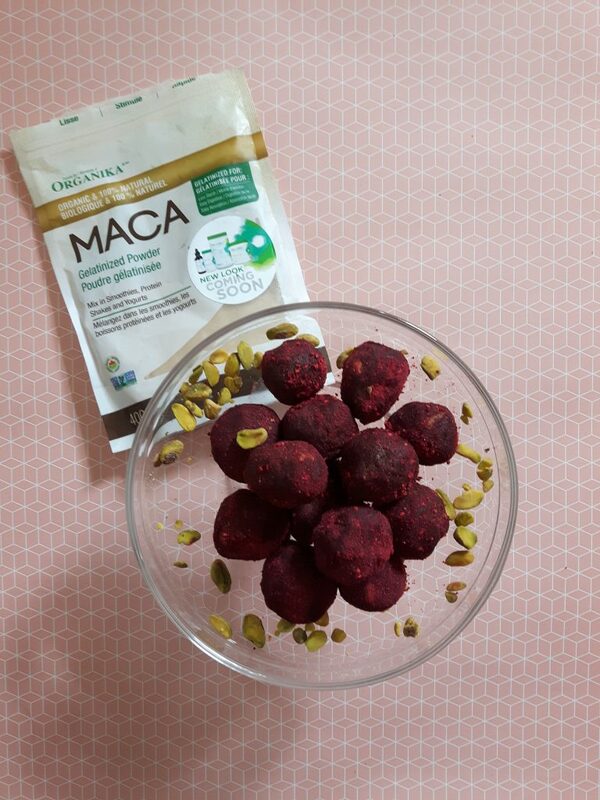 To learn more about Maca dosages and the benefits of this wonderful Andes superfood check out the Maca page. This unusually green nut is native to Western Asia as well as to Turkey and Afghanistan. This nut, grows within fruit on small trees, which have been prized since antiquity. Pistachios produce crops in alternative years, so make sure you purchase pistachios from a reputable company. 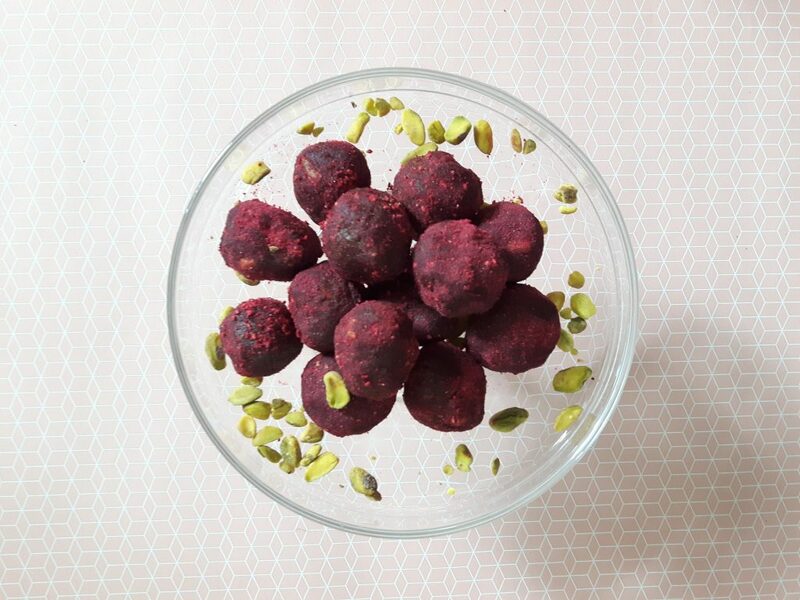 The greenness of this delicious nut is due to the presence of chlorophyll! 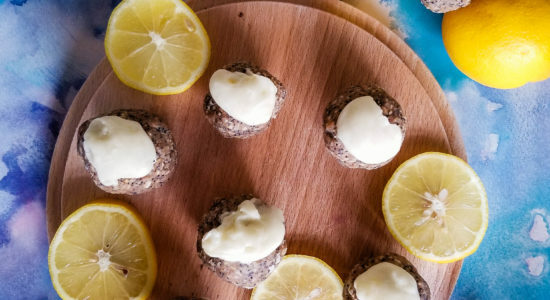 This phenomenal alkalizing and antioxidant compound is one reason why this nut is so nutritious. Some kernels are yellow and other white, but the darkest green ones are the most highly valued. In the USA (and likely elsewhere on the planet) it is customary to dye imported pistachios to rid imperfections. Pistachios are an amazing source of vitamin A, E (gamma tocopherol), copper, manganese, potassium, calcium, iron, magnesium, zinc and selenium. 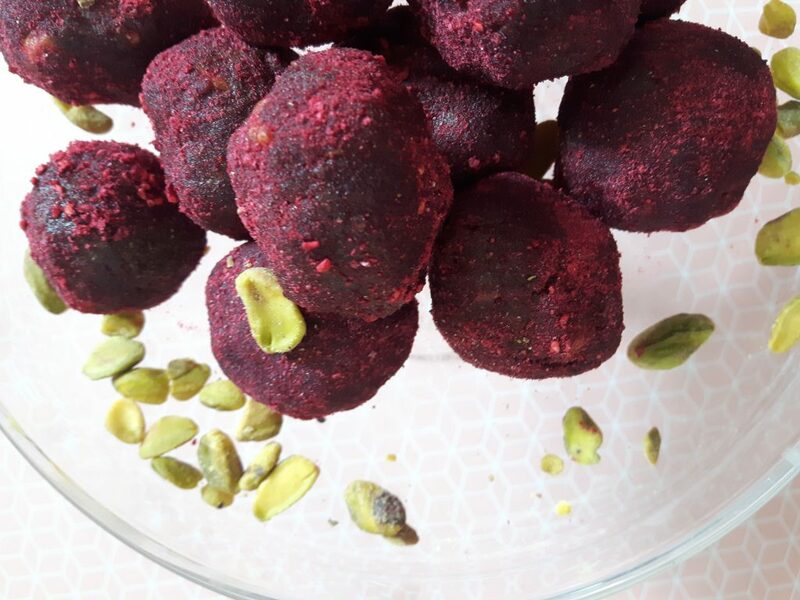 The Vitamin E content in these tiny nuts accounts to about 23g per 100g serving, providing an antioxidant and antiinflammatory boost, as well as stimulating hair follicle growth and strengthening it in the process. Pistachios are also a great source of B6, which is beneficial for the nervous system, aiding in building a flexible and strong myelin sheath. This wonderful bring red berry grows wildly in cooler regions of the Northern hemisphere and in some locations in the south. Cultivated first by the Ancient Greeks, it is now widely hybridized. Raspberries are a great source of Vitamin C, Manganese, Fibre, Copper and Vitamin K. This berry aids in regulating blood sugar levels and possess potent anti cancer fighting properties. Mushrooms have amazing health properties, Cordyceps are no exception. First described in Ancient Chinese texts, these small orange mushrooms have been found to be used in Tibetan medicine. In Traditional medicine it has been shown to be beneficial for all illnesses in the body, aiding in restoring energy, appetite, endurance, stamina and improving both libido and sleep quality. Cordyceps have been shown, though studies to aid in increasing longevity, aiding in the elimination of erectile dysfunction, Strengthening and healing the liver and kidneys, as well as being beneficial for individuals with cancer and diabetes. 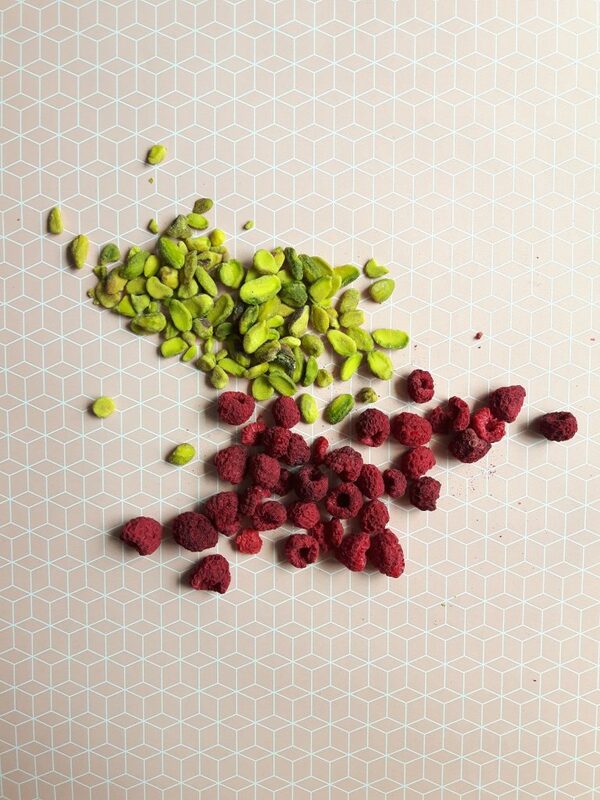 Tart and sweet, the combination of raspberry and pistachio is melodious. A perfect pick me up to help you keep going. Place all the dry ingredients into a bowl. Ground almonds, cacao powder, carob powder, maca, cordyceps, salt. In a separate bowl combine the wet ingredients. You may want to soak the dates beforehand so that they are easier to mash (or you can simply throw them into a food processor). Almond butter, dates, maple syrup, Combine well. 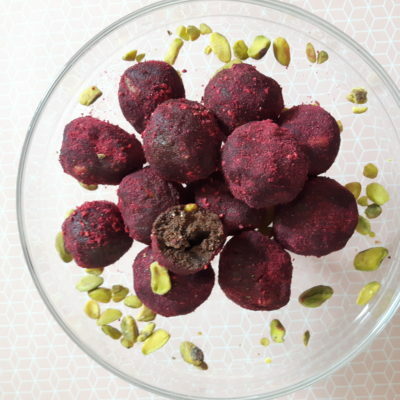 If doing it by hand slowly add in the dry ingredients into the wet, alternating with the freeze-dried raspberries and pistachios (food processor, do the same). You can also at this point add chocolate chips. If the batter is too dry, add some more almond butter (or maple syrup, but it will become sweeter as well). If it is too wet you can add some more ground almonds. 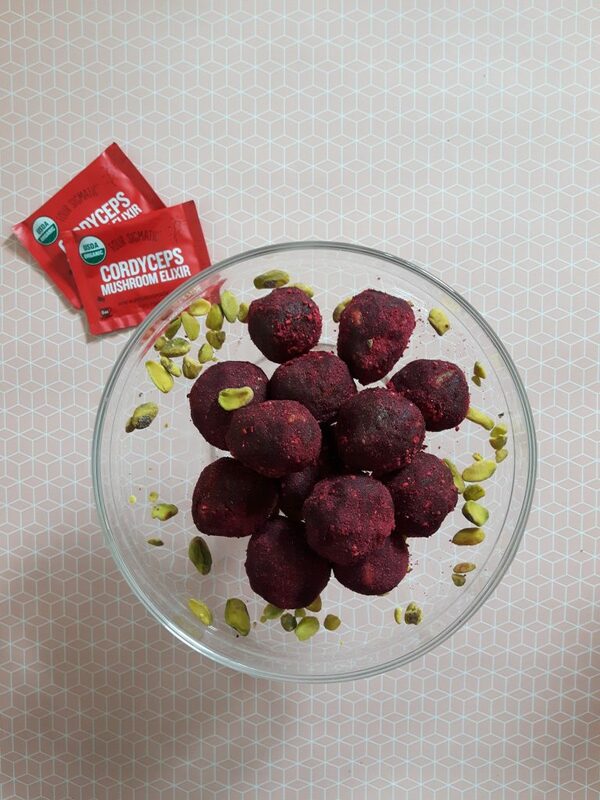 You can, if you so desire, roll the balls in some powdered raspberries for an extra tangy sweet kick. This will make between 18-20 balls. Arya, J. 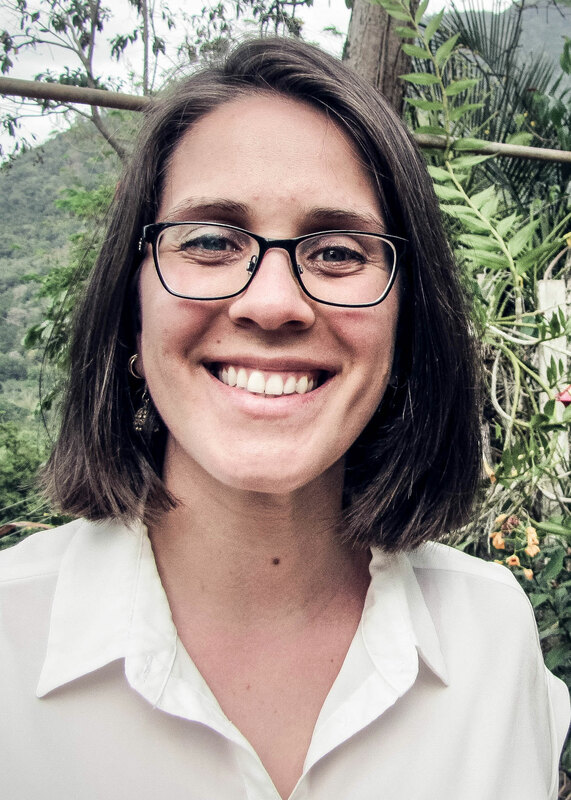 (2014). Food is your best Medicine. Arya Publications. Davidson, A. (1999). The Oxford Companion to Food. Oxford University Press: Oxford. Mateljan, G. (2007). The World’s Healthiest Foods. George Mateljan Foundation. Panda, A.K., & Swain K.C., (2011). Traditional uses and medicinal potential of Cordyceps sinensis of Sikkim. Journal of Ayurveda and Integrative Medicine, 2(1), pages 9-13.